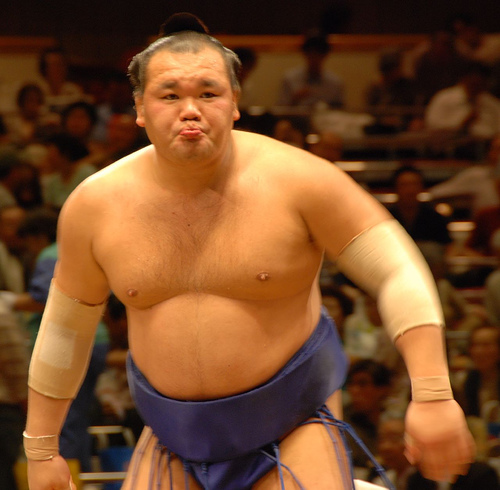 Japanese sumo wrestling star Toyozakura has taken a thirty percent pay cut after it was discovered that he beat an 18-year-old apprentice wrestler with a cooking utensil. Toyozakura, whose ladle-wielding assault left his young victim bleeding and needing eight stitches, publicly appologized for the incident. He has been ordered to take the salary cut for his violent outburst and costing his sumo wrestling organization a loss of face. Violent hazing, or beating during training, has long been seen as customary, contributing to the sport’s struggle to attract new recruits. But there was a public outcry over the death last year of a teenage apprentice who was beaten with a beer bottle and a baseball bat. Toyozakura admits he beat his apprentice over the head with the ladle.